I wanted to post about a resource for those of you researching your Dutch ancestry. I must admit that I have tried to write this several times, but have been stopped dead in my tracks because of my lack of familiarity with Dutch Genealogical Research. Having said that, I met a friend Mary Scott who has done extensive research on Dutch ancestry and has a favorite website that she visits frequently. I asked permission to quote her in this post as she explains how to sign up and log into the website. 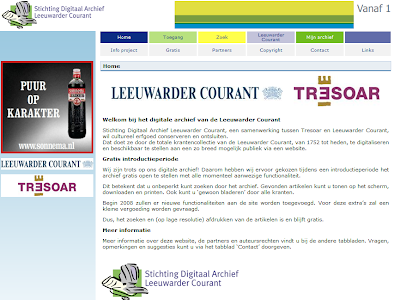 The website Leeuwarder Courant is a collection of the oldest Dutch Newspaper. The Leeuwarder Courant collection spans approximately 250+ years of publications from 1752 to present. Until the end of the year 2007, access to the site is free. You might ask what a newspaper collection can provide for genealogical researchers. The newspapers can contain, Civil Registrations, Birth, Marriage, Death and other announcements. "This morning an individual on the Dutch-Midwest email list at rootsweb.com informed the list that the oldest Dutch newspaper has opened its digital archives. Researchers can search the newspapers for free until the end of the year. 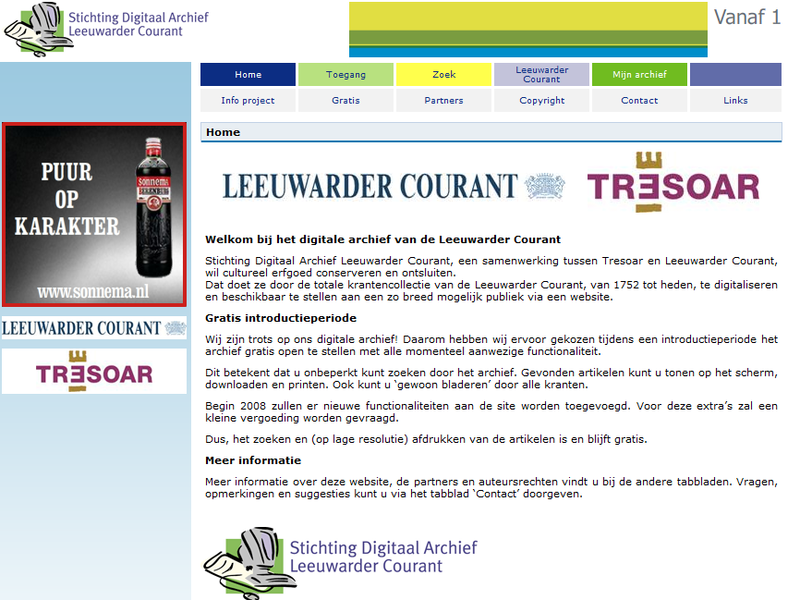 Leeuwarder Courant" is from the city of Leeuwarden in Friesland (Frisia). It was first published in 1752 and the archives stretch into the contemporary times. The "Leeuwarder Courant" is one of the oldest newspapers in the Netherlands and might even be the oldest one." Of course I plan to research further in the "Leeuwarder Courant" during November and December because it was so profitable. If you have Dutch ancestry, this website might interest you. If not, read no farther as I am just giving steps to help those who might need assistance with the Dutch terminology. To use the website properly, it is necessary to register. A password is then sent to your email. This password can be changed. Although I don't know much Dutch, I was able to figure out the registration process from the few words I do know. 2. Click on the yellow box with the word "Zoek" in it. New window opens. 3. Click on the word "Vrij" under the word "Zoek". 4. Click on Registreren to register. New window opens with three fields to fill in. 6. Click on blue box with word "Registreer". A password from the website is sent to your email address. If you want to change the password to a word of your choice, click on the box called "Wachtwoord". 1. Enter the email address from your registration. 2. Enter the password mailed to your email account into the "Oud Wachtwoord". 3. Enter your choice for a new password in "Nieuw Wachtwoord". 4. Enter the new password a second time in field for "Nieuw wachtwoord (controle)". 5. Click on "Wachtwoord Veranderen" box. 6. Notification will be sent that your password is changed plus what it is. To log into the website, click on "Login" box from home page. 1. Put in email address. 2. Put in password in "Wachtwoord" field. To search, login and then click on "Zoek" and then "Vrij". 1. New window opens with title "Zoeken". 2. Zoekterm -- put in surname or other search terms. 3. Periode -- choose "gehele archief" for all four centuries; narrow choices by choosing either 21ste eeuw (21st century); 20ste eeuw (20th century); 19de eeuw (19th century) and 18de eeuw (18th century)." Mary advised me that the articles can be printed by doing a right click on the mouse and choosing "print picture". This is the easiest way to print as there is no print button located on the page. I want to thank Mary for her generosity and willingness to share these wonderful instructions on utilizing the website. If you would like to research the papers, you can click Leewarder Courant Archives.